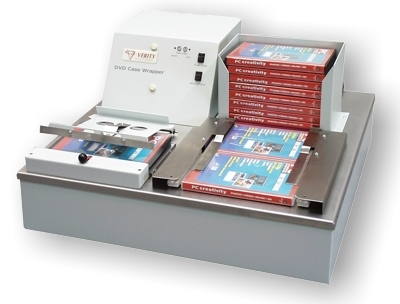 Operators wishing to wrap small to medium quantities of CD jewel cases can now achieve a quality finish equal to the standard of more expensive finishing machines, with the VS4000 Jewel Case Wrapper from Verity Systems. 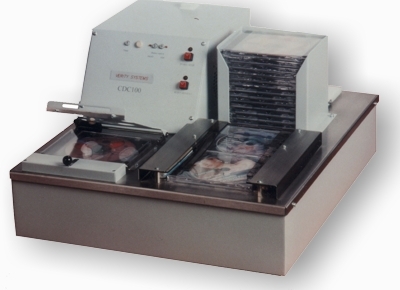 This tabletop CD wrapper is dedicated to small or medium scale production of discs and is a cost effective solution, providing professionally finished packaging for short run work, at a tenth of the cost of industrial equipment. This semi-automatic CD overwrapper is simple and effective. A pre-cut sheet of polypropylene wrapping material is placed on the manual platform. The jewel case is simply placed on the pre-cut sheet and the operator closes the cover, which tensions the wrapping and makes the first heat-seal. The case is then placed into the hopper for the second fold and seal operation, which is fully automatic. The result is a professionally folded and sealed CD jewel case. The sealing temperature is electronically controlled and can be set to the desired value. An electronic security system stops the wrapper machine operating in the case of incorrect usage. Polypropylene wrapping material can be supplied in boxes of 10,000 sheets from Verity Systems. The result is a professionally folded and sealed CD jewel case suitable for even the best retail presentations and all this for a fraction of the cost of outsourcing. 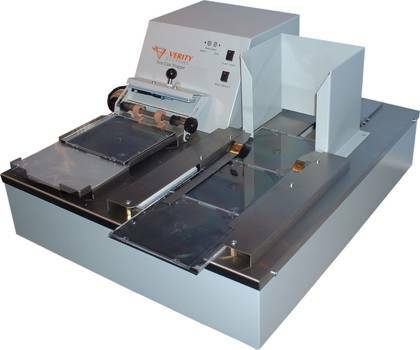 Operators wishing to wrap small to medium quantities of slim line jewel cases can now achieve a quality finish equal to the standard of more expensive finishing machines, with the VS4000SL over wrapper from Verity Systems. This tabletop wrapper is dedicated to small or medium scale production of discs and is a cost effective solution, providing professionally finished packaging for short run work, at a tenth of the cost of industrial equipment. This semi-automatic operation is simple and effective. A pre-cut sheet of polypropylene wrapping material is placed on the manual platform. The slim line case is simply placed on the pre-cut sheet and the operator closes the cover, which tensions the wrapping and makes the first heat-seal. The case is then placed into the hopper for the second fold and seal operation, which is fully automatic. The result is a professionally folded and sealed case. The sealing temperature is electronically controlled and can be set to the desired value. An electronic security system stops the wrapper machine operating in the case of incorrect usage. Polypropylene wrapping material can be supplied in boxes of 10,000 sheets from Verity Systems. The result is a professionally folded and sealed slim line jewel case suitable for even the best retail presentations and all this for a fraction of the cost of outsourcing. Operators wishing to wrap small to medium quantities of DVD (Amaray) cases can now achieve a quality finish equal to the standard of more expensive finishing machines, with the VS4000 DVD case over wrapper from Verity Systems. This table top case wrapper is dedicated to small or medium scale production of discs and is a cost effective solution, providing professionally finished packaging for short run work, at a tenth of the cost of industrial equipment. The semi-automatic operation is simple and effective. A pre-cut sheet of polypropylene wrapping material is placed on the manual platform. The slim line case is simply placed on the pre-cut sheet and the operator closes the cover, which tensions the wrapping and makes the first heat-seal. The case is then placed into the hopper for the second fold and seal operation, which is fully automatic. The result is a professionally folded and sealed jewel case. The sealing temperature is electronically controlled and can be set to the desired value. An electronic security system stops the wrapper machine operating in the case of incorrect usage.